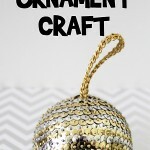 Today I have another handmade Christmas ornament craft to share with you! 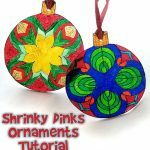 This easy Diorama Christmas Ornament Craft is perfect for gift giving, or just decorating your tree! Plus, this is super fast to make. 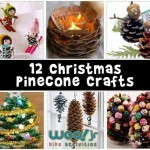 Just plan ahead, because it takes a full day to dry and be ready to display or wrap. Aleene’s Glitter Snow. This is a self hardening paste that looks like snow, and can hold small objects. Diamond Dust. 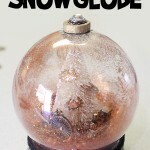 This is a finely ground glass that gives a brilliant snow like sparkle. 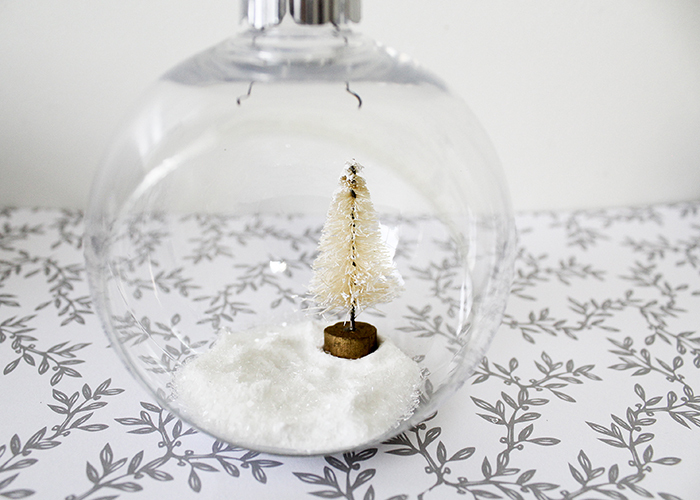 You can also use clear glitter or buffalo snow flakes. Small trinkets. 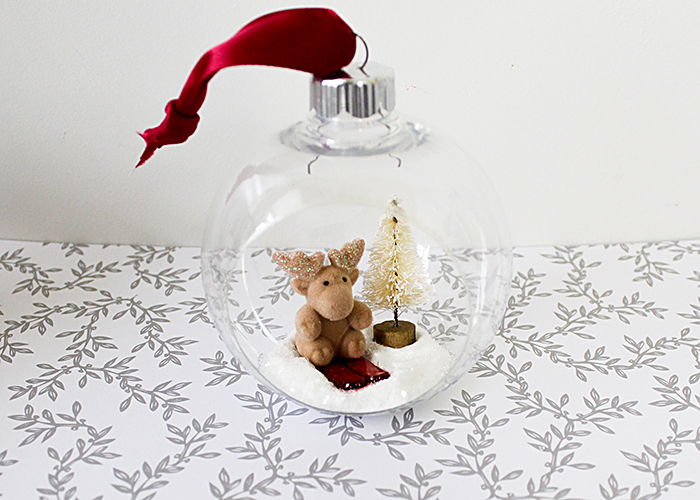 I chose to use a skiing moose and a tree, but this would be perfect for a nativity or snowman scene too. Popsicle stick. Or palette knife or any disposable object that can spread paste. 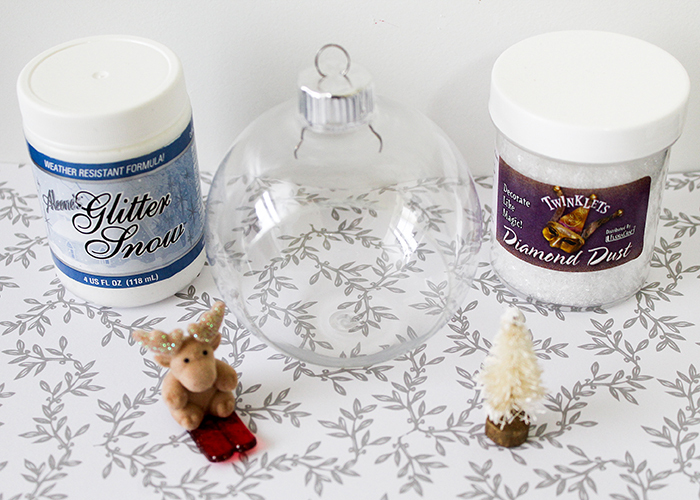 Start by spreading a generous amount of the glitter snow paste in the bottom of your ornament. 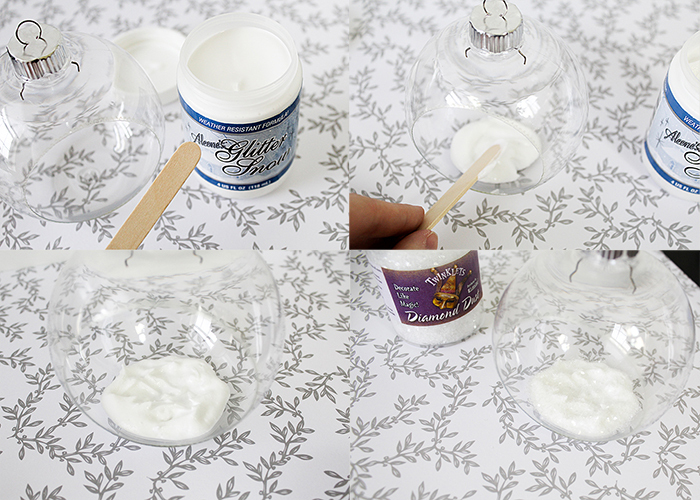 Using your tool of choice, make a few hills and valleys in the paste, so it looks like real snow drifts. When it looks how you’d like it to, sprinkle the diamond dust on top of the snow so it’s extra sparkly. 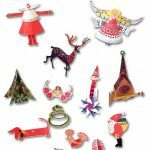 Starting with the trinkets that go in the back, gently place them in the ornament and press them into the snow. The “snow” is still very wet, but will hold the small objects upright and in place. I put my tree in the background first, and then added the moose in front. 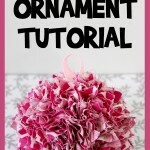 Pick a piece of ribbon or an ornament hanger to attach to your ornament. Now here’s the hard part, the “snow” takes 24 hours to dry! 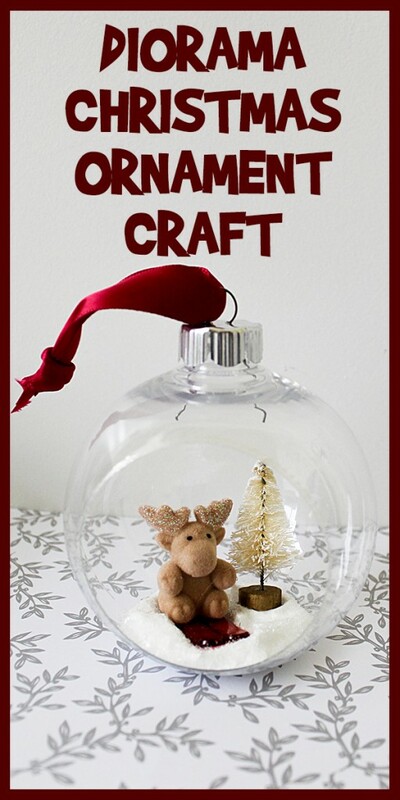 So just set your ornament in a safe place, and hang it on your tree the next day! Don’t forget to get creative with this! Explore the dollhouse section of your local craft store to find a variety of small miniatures, or even make your own with clay!